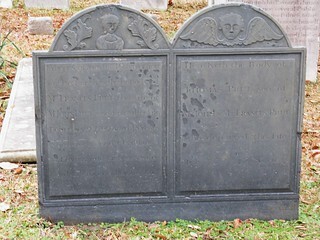 It looks like the child with wings was reserved for the tombstones of those who passed at a very early age. In hopef of a joyfull Resurrection in this Earth lyeth the Body of Mrs. Frances Prue the wife of John Prue who departed this Life February 9, 1769, Aged 45 Years. She was a good Christian, a loving and virtuous wife and a sincere friend to all who knew her. Here lyeth the Body of Thomas Prue son of Mr. John & Mrs. Frances Prue who departed this Life July 7 1717, Aged 3 months & 5 days.